The aromatic essential oil from sandalwood timber is in high demand, especially in Asia. 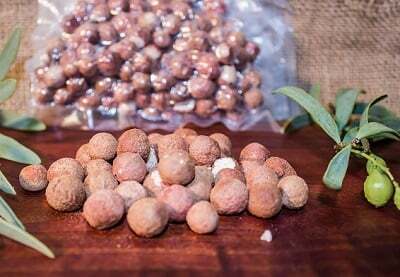 The sandalwood nut is also developing as a gourmet native ingredient. There have been incidents of poaching from Australian groves. 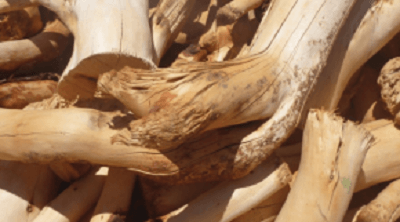 In the early 2000s, a shortage of the premium variety (Indian sandalwood) occurred, as significant Australian plantations were nearing maturity. South Australian growers had mostly small and medium sized groves. The Western Australian network, though more established, covered vast geographic areas with varying species, making group efforts difficult. There was limited nationwide co-ordination or government support for monitoring or quality controls. There was potential to grow the Australian industry. Edmund Gooden, a grower from Belvidere outside Adelaide, approached Farming Together for assistance to explore processing options - there was no sandalwood nut cracking facility in SA. At the same time, Bob Huxley, a WA-based grower wanted to understand product viability – should he focus on the nuts for restaurants? the oil as a cosmetic? or the timber for carbon credits? 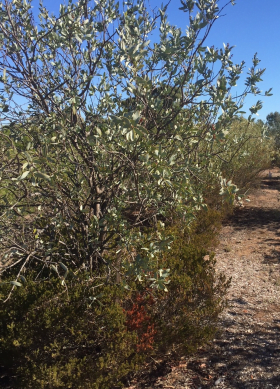 As a low rainfall, low water-use product, with a 20-30 year period before harvest maturity, sandalwood growers have had some time to think about these matters. WA’s longer-established industry had two nut processing facilities, but transporting nuts from SA is against quarantine regulations. Part of the older WA network, Bob also wanted assistance to explore quality controls to help stabilise prices. Both farmers aimed to make the sandalwood supply chain more sustainable. Farming Together put these groups together. 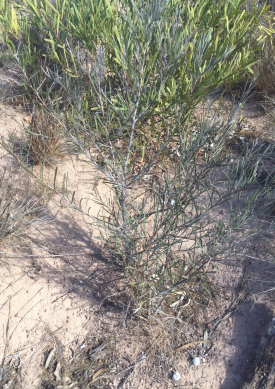 Young sandalwood tree at Ceduna, Eyre Peninsula. Mature sandalwood at Strathalbyn, Fleurieu peninsula. An experienced ag-focused market researcher was found, to review the national industry, identify stakeholders and explore potential. A workshop, bringing SA and WA growers together with co-operative experts, was the first step. This activity helped to identify issues and established a cross-state working group, to explore collaboration structures. Two solid co-operative business plans are being welcomed in a revitalised cross-state industry. “These plans are helping to expand grower confidence – in export market access, processing partnerships and the viability of sandalwood for revegetation and stock protection. Farming Together helped us to work with out-of-region growers who have similar issues” - Edmund Gooden. Industry momentum is a key outcome which has also highlighted possibilities for local employment and land care projects. 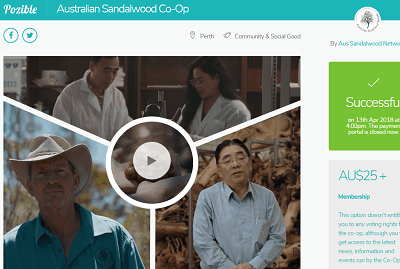 The crowdfund campaign for a national co-operative raised $5650 in 2 months. That’s a great start! Industry connections, collaboration and sharing data for making decisions are now high priorities. Bruce Storer, a WA grower and leader of the Australian Sandalwood Network, says Farming Together’s support has helped to unifying growers. “Assistance with business planning has been a real eye-opener. Now we have a clearer view of the pitfalls, and we have the co-operative structures in place to make the most of our opportunities” - Bruce Storer. “Getting farmers to join in efforts with other growers is one of the best tools to use… farmers learning from one another and sharing information is so important” - SA grower.